If you are trying to exfiltrate some data from a location and don’t want anyone to capture your source IP address, the best way to do that is to have an anonymous proxy router that can disguise your real IP address behind its own. Such devices have existed for many years, but Ben Caudill has come along with a new version that he calls ProxyHam. It works by connecting your network to the router’s Wi-Fi bridge, and in turn, it routes your data over a 900 MHz radio to a distant computer with a hi-gain antenna. The antenna picks up the signal and masks your IP address, keeping you at a distance, supposedly safe from detection. Caudill was scheduled to speak at the DEF CON security conference earlier this month to show off his innovation, under the heading called the Anonymous Proxy Router Project. The presentation was supposed to demonstrate how to build an anonymous proxy router for a couple hundred bucks out of commonly available parts. Sadly, the session was canceled in July; the principles are mum as to the cause. Units that were built by Caudill’s company Rhino Security have been destroyed and aren’t for sale, and the source code is no longer available. One reasonable explanation for why the talk was canceled is because it’s likely that ProxyHam breaks the law. First, FCC Part 97 has a prohibition against using encryption — such as the SSH or HTTPS protocols that you most certainly would be using with ProxyHam — over the 900 MHz band radio signals. Then, depending on where you place your ProxyHam or its equivalent, you could be doing something unauthorized on the target network, which comes under the Computer Fraud and Abuse Act. Certainly, the idea behind ProxyHam isn’t going away, and various folks around the Internet have stepped up to the challenge. I found three sources on how to build a similar version of the router. Benchoff covered the task for Hackaday, and an alternative anonymous proxy router was suggested by Samy Kamkar via TechWorm. And there is a third post from Robert Graham of Errata Security that shows yet another way to construct the device. All three versions cost about the same and have about the same minimal level of skill required to assemble the various parts. This means that no matter what the motivations behind ProxyHam and its peers, enterprise IT managers should be on notice. They must be aware that these kinds of devices could be operating over their networks; it is only a matter of time. The best defense is to make sure you tune your intrusion prevention filters. You can also use other tools to monitor what kinds of data leave your network. If you don’t have any outbound networking monitoring in place, now is the time to consider implementing such a tool. The ProxyHam router isn’t the only way data can be sent off-site: A simple connection to a personal Google Drive account is a lot less work and may be just as effective. But this issue is certainly worth more consideration because of the sheer impact it could have. One of the consequences of bringing your own device to work is in having to keep the work-related files on it secure once it enters the enterprise. This can be a challenge, and a dozens of vendors are now wrapping themselves in the trendy category of “mobile device managers” or MDMs. But trying to understand whether these products help secure the device, the user, the applications or the various files stored on each device can be vexing, and the vendors don’t make things easy for you to readily compare their features. In my article posted today on ITworld, I examine several of these products, review what should be in your next RFP if you are in the market to buy an MDM, and what is involved from both the IT manager and the end user perspectives when deploying these tools. Do you long for the days of yore, when all computers came with a wired Ethernet port and Starbucks was once a coffee shop and not a connectivity destination? Sometimes I do, because life seemed much simpler then. We didn’t have to worry about balancing the radio output on wireless access points, nor worry that a war driver was sitting in the parking lot sucking down bandwidth and trying to penetrate our perimeter. Heck, even the notion of a network perimeter was fairly solid back then. In an article for HP’s Input Output, I talk about then and now. And I miss those days when we had more wired Ethernet around. It made for some simpler times. PC World: Is it time to switch to an all-wireless network? In a word, yes. If you haven’t looked at your network cabling in a quite awhile, it might be time to consider upgrading to an all-wireless network infrastructure. Why? Because wireless is a very viable option that can connect all your PCs together. You can read my column in PC World here. For wireless applications to function properly, they require the right in-building coverage, which involves more than just proper antenna placement and access point design. In this story for Baseline magazine, I look at some of the issues involving in-building coverage. As wireless becomes more ubiquitous, it enables an entire collection of new applications that can be used to communicate with employees when they are away from their offices, monitor sensors around a building and even transmit video streams. The idea of going wireless anywhere – not just where you have WiFi – is appealing. And the adapter cards keep getting better. I tried out this 3G card from AT&T on both Windows XP SP2 and SP3 machines – with SP2 you’ll need two reboots to get everything installed. Near the business end of the connector is the SIM card that enables it to work with the AT&T network. The speeds are much better than the 3G connection on my iPhone, with the claims from AT&T of 700-1400 kbps down and 500-1200 kbps uploads about twice what I observed on my 3G iPhone. One oddity – it didn’t like the tracert command in Windows but could do command line FTP transfers just fine. 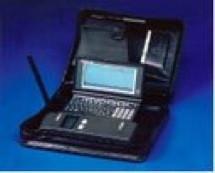 There is also a simplified text messaging application so you can compose texts and send them on the computer keyboard. If you need on-the-go Web surfing and email, this is a solid product, once you get past the installation. Macs use a different connection manager that comes directly from Sierra Wireless (the makers of the adapter), while Windows uses one that has some added features to help you make free use of AT&T WiFi hot spots. The initial cost of the card is rebated if you get a two-year data plan. If you don’t, the upfront cost is $250. Either way, you still have to pay $60 a month, which includes a 5 GB monthly usage cap before you get charged on additional usage — so if you are going to be transferring a lot of files, this may not be the solution for you. I am living in a cell dead zone temporarily and thanks to Arc’s Freedom Antenna, I can at least get a few more bars of signal strength and actually hear my callers. The antenna is about four inches high and has various cables to attach to a few different phones — you can search the company’s Web site and find out if yours is covered. In my case, the Razr has a small rubber plug on the back that pops out and can be connected. It is a bit cumbersome, and I still leave the antenna by the window to pick up the best signal, but the arrangement works. The antenna is less than $30 at major online retailers.